Ramen To The Rescue: How Instant Noodles Fight Global Hunger : The Salt The supercheap and palatable noodles help low-wage workers around the world get by, anthropologists argue in a new book. And rather than lament the ascendance of this highly processed food, they argue we should try to make it more nutritious. 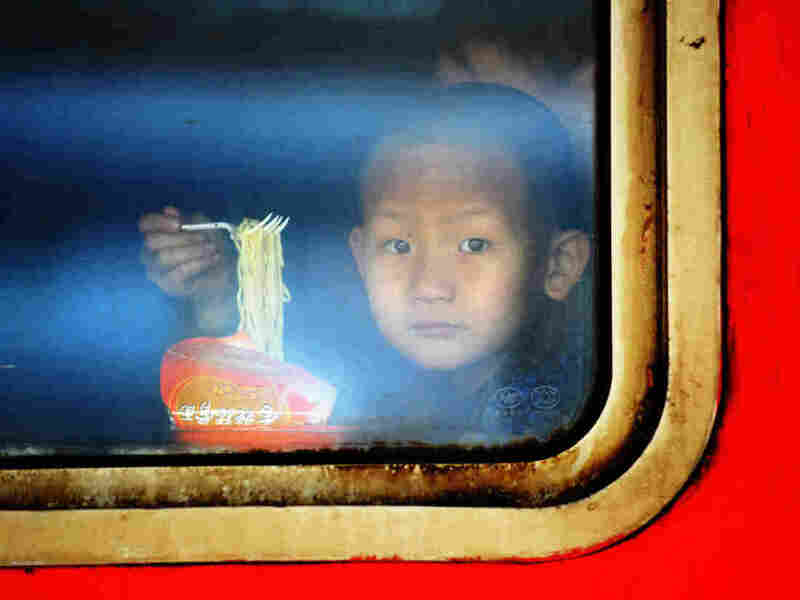 A child eats instant noodles on a train at the Harbin Railway Station in northeast China. Ask about the foods that have conquered the world and you're likely to hear about Coca-Cola and McDonald's Big Macs. But the most successful industrial food ever produced flies far under the radar. 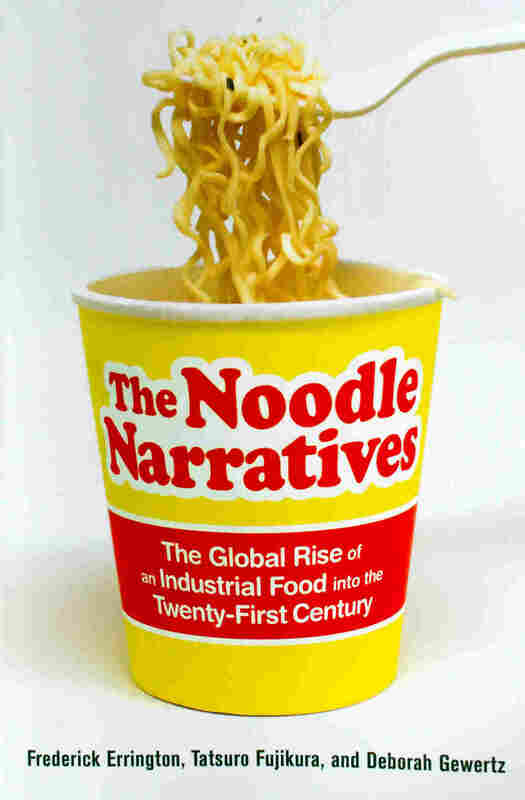 And it has finally been outed by three anthropologists in a fascinating new book The Noodle Narratives, which analyzes the precipitous rise — or "brilliant career," as the authors say — of instant ramen, from its birth in postwar Japan to its sales of just over 100 billion servings worldwide in 2012. Take a moment to digest that figure: It's about 14 servings for every single person on Earth, at a cost of just a few cents apiece. That's an astonishing quantity, especially to American consumers, who don't tend to think of the stiff, wavy blocks of noodles as an important staple (though they are for some college students, inmates and low-income Americans). And while our foodie culture currently has a fling with ramen (think ramen bars and the ramen burger), we're only the world's sixth-biggest market for the noodles, according to the World Instant Noodles Association. Our consumption is dwarfed by that of China and India — and even Vietnam. Indeed, it's the multinational noodle companies' conquest of countries like Papua New Guinea, Nigeria, Brazil and Mexico that really interests the anthropologists: Frederick Errington of Trinity College, Tatsuro Fujikura of Kyoto University and Deborah Gewertz of Amherst College. And it's here that they make one of their most intriguing arguments: Instant noodles do good by alleviating the hunger of millions of people around the world. These supercheap, superpalatable noodles, they write, help the low-wage workers in rich and poor countries alike hang on when the going gets tough. "They're cheap and tasty and tweakable," Gewertz tells The Salt. "They're capable of being transformed to everyone's cultural taste." In Thailand, instant ramen is seasoned with lemongrass and cilantro. Mexicans can buy Maruchan noodle soup cups flecked with shrimp, lime and habanero, among other flavors. Papua New Guineans have incorporated the noodles into rituals as cardinal as weaning babies and honoring the dead, she says. In Japan, the birthplace of instant ramen, the consumer appetite for novel ramen products is so ravenous that manufacturers introduce 600 new flavors a year, the authors report. But it all started in the postwar period. Back in 1957, businessman Momofuku Ando (yes, the namesake of Chef David Chang's beloved restaurants) decided he wanted to invent an industrial take on freshly made ramen — the stuff Chang has helped make trendy again — for his hungry, budget-minded compatriots using surplus wheat donated by the U.S. It took Ando years to perfect the process of making a dry block of noodles. But ultimately he succeeded by applying the "principle of tempura": steaming and dousing the noodles in chicken broth and then bathing them in hot oil. This dried them out and made them shelf-stable but also easy to rehydrate. He added the winning combination of MSG, salt and sugar (which now comes in a flavor packet) to round out the flavor. And to this day, manufacturers haven't strayed far from Ando's original recipe, the authors report.. While not exactly nutritious, instant noodles are a "proletariat hunger killer," as the anthropologist Sidney Mintz would say. They're made with wheat flour, which has a high glycemic index (a metric for how soon a food is likely to make you hungry again). But they're also fried in palm oil, which is 49 percent saturated fat — higher than pork lard (40 percent) and soybean oil (14 percent). All that fat keeps you feeling full longer and helps bring the noodles' overall glycemic index down. The fact that instant noodles become soup once you add water helps, too — as the authors note, soup provides longer satiety than, say, noodles alone. And that helps explain why ramen have become a staple of the world's undernourished and part of some humanitarian food aid packages. Palm is the industry's oil of choice because it's cheap, it can withstand high heat, and it has a longer shelf life than other oils. But in the U.S., we're told to eat palm oil sparingly because it raises LDL cholesterol levels. So is it really wise for so many people around the world to be so reliant on instant ramen for sustenance? Why can't the urban poor eat something more nutritious than this highly processed, high-fat food? Sure, that would be ideal, the authors say, but the reality is that in many cities, the poor lack affordable alternatives that are more healthful than ramen. "How are you going to feed these people?" says Gewertz. "I would love to feed them with fruits and vegetables at the local markets, but they are expensive." 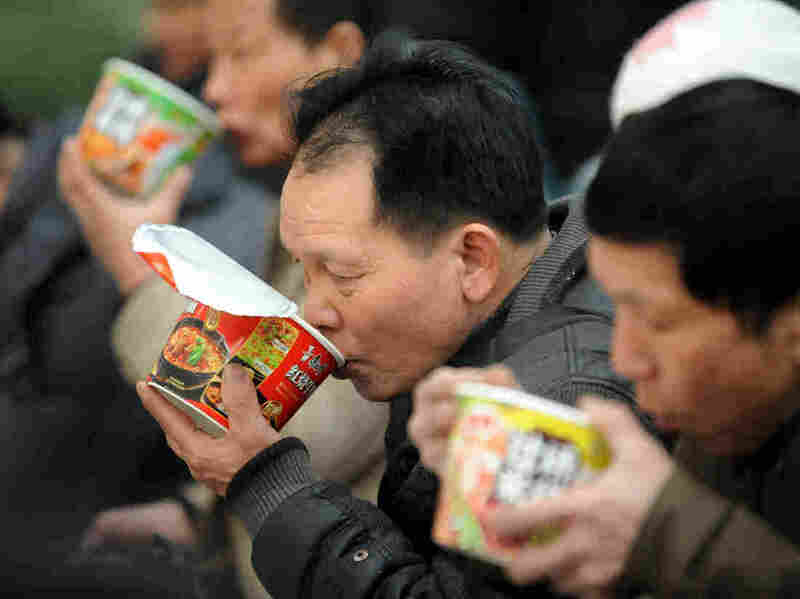 Passengers eat instant noodles at the railway station in Shenyang, China in January 2013. The authors say that "real food" advocates like journalist Michael Pollan, who wring their hands over rising consumption of industrial food like ramen, raise important questions about its perils. But the authors also call ramen a "virtually unstoppable" phenomenon. And they foresee a world of 9 billion people "in which the affluent will be presented with too many food choices and [will be] called upon to use their survival skills to choose wisely, and in which the poor will have to use their survival skills to get by on cheap food" like ramen. "I'd love to take Michael Pollan to a squatter settlement and have him deal with poor, hungry people in such circumstances, who have no choice of going back home to grow subsistence crops or be part of a regional food system," says Gewertz. "Subsistence agriculture is hard, dirty and hot work. People want out of it. It's not to be over romanticized." Instead, as Gerwertz tells us, a better way to help the poor who rely on ramen is to make the noodles more nutritious: They could be "reduced-sodium, lower-fat, higher-fiber, better fortified," though that will also translate into a slightly higher price. "We find it difficult to imagine the increasingly urbanized food future without this humble form of salt, MSG-enhanced, oily and sometimes sugary" food, they write. But "we conclude [that it's for the best] with great reluctance."